1280 West Condos are 38 stories of homes in the Arts Center District, located conveniently across the street from the Arts Center Transit Station. Huge amenities list including a 7th floor pool/sundeck with sports deck w/tennis, basketball, track, indoor racquetball court, billiards room, party room w/kitchen, complete 24/7 gym with separate male/female steam rooms. Tanning and massage available. Onsite cleaners, media room, meeting rooms, free wifi. 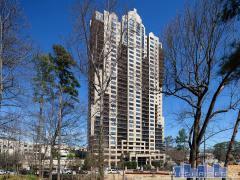 Walking distance to Atlantic Station or take free shuttle. Transit direct link to Atlanta Airport. More like a recreational compound than mere condo amenities, this condo tower has areas to play everything from raquetball, to tennis, and even basketball onsite. Remarkably quick access to the highway is another perk when it's time to leave these amenities behind for the day. Have any comments or questions about 1280 West Condos? Ask your question and/or share your thoughts about this Building. I am interested in purchasing a residence. Preferably a two story or entire floor penthouse.